Pathetic! Obama Says He Would Still Oppose the Surge... Credits Sunni Awakening Members For the Success! Pathetic! Obama Says He Would Still Oppose the Surge… Credits Sunni Awakening Members For the Success! But, Please Don’t Question His Support For the US Military. After meeting with General David Petraeus today, Barack Obama gave credit to the Sunni Awakening members and the Shia militia members for the success of the surge. Well, that was a wasted afternoon for General Petraeus. True- And, not so hard to figure out, unless you belong to his fan base. Finally, Barack Obama admits the surge was a success and gives credit to where it is due… To the Sunnis. Barack Obama credited the Sunni Awakening Members and Shia fighters with the success of the surge today in an interview with ABC. Sen. Barack Obama said it was “fair” to notice that he did not anticipate that the surge of U.S. troops into Iraq would be coincident with the so-called Sunni Awakening and the decisions of Shia militias to reduce their footprints, the combination of which led to measurable declines in violence. How dare he steal this great success from our military and spin it for his selfish political purposes! 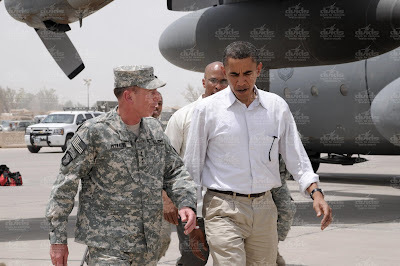 After witnessing the great progress in Iraq today with hero General David Petraeus, after a three year absence from the region, Barack Obama concluded that he would still oppose the surge of troops. 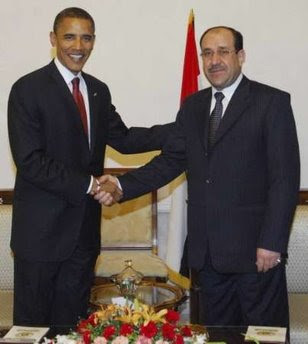 Someone should have told Prime Minister Maliki to watch his back. There’s an ambitious and inexperienced Democrat in the room. They should have sent Barack the video. He knew what he was going to say before his feet hit the green zone. HotAir has more including video of Barack’s big adventure.